Is Snap Backup open source? Yes, it's license under the GPLv3. Everyone is free to use Snap Backup and even hack on the code . Does Snap Backup perform "incremental" backups or "full" backups? Full. Incremental backups are good for many needs, like backing up an entire hard drive, but such an approach adds complexity to the backup process. Snap Backup is intended for people who just want to backup their data files not their entire hard drives. Does Snap Backup use the archive bit? Does Snap Backup have a restore feature? No, that's not really necessary. Just double-click a ".zip" backup file, and your OS will expand the contents for you. Hopefully, you will find restoring to be an infrequent activity. Can Snap Backup be used to backup up a hard drive? No. The vast majority of files on your hard drive are operating system files and application program files that do not need to be backed up. Snap Backup is intended for frequent use in backing up just your valuable data not your entire hard drive. Which files and folders do I need to backup on macOS? Can Snap Backup save my data to a portable USB drive? Yes. One of the simplest external data devices you can use with Snap Backup is a portable USB drive. Just insert the drive into one of your USB ports and specify the USB drive's location in Snap Backup's "Copy Backup To:" option. On Apple macOS, USB drives show up in the "Volumes" folder with the name of the drive, such as "/Volumes/MyData". On Windows, the USB Drive will show up as a drive letter, such as E:\. Can Snap Backup copy files instead of compressing them into a zip file? No. Simply copying files instead of zipping them up into a single file is certainly useful, but that capability is better suited to a copy utility instead of a backup utility. Additionally, Snap Backup is designed to be very easy to use, and adding a copy feature could undesirably complicate the user interface. Does Snap Backup support multiple profiles? Yes. A typical use of multiple profiles is to backup your work files separately from your personal files. On the "File" menu, go to the "Multiple Profiles" item and select "On". Does Snap Backup have filters? Yes. Filters give you more control over exactly which folders and files to backup. The filters support wildcards ("*") and can also exclude files based on their size. Can Snap Backup schedule backups to happen automatically? Yes, with some scripting. To facilitate launching backups from scripts and schedulers, Snap Backup can be run from the command-line. Use the scheduler included with for your operating system (for example, "cron" on Linux and "Scheduled Tasks" on Windows) to automate your backups. For instructions, see the "Command-Line Option" section in the Snap Backup User Guide. What languages does Snap Backup support? Snap Backup supports Albanian (Shqip), Dutch (Nederlands), English, Esperanto, German (Deutsch), Indonesian (Bahasa), Italian (Italiano), Korean (한국어), Portuguese (Português), Romanian (Română), Russian (Русский), Spanish (Español), and Slovene (Slovenščina). Snap Backup will attempt to detect your default language and use that if available. Why does my zip utility launch whenever I try to run Snap Backup? Some ill-behaved zip utilities for Microsoft Windows take over the file association for files ending in ".jar". The ".jar" file extension is the standard extension for a Java program (an executable Java ARchive) and indicates the file should be opened by Java — not by a zip utility. The easiest way to fix this annoying problem is to just reinstall Java, which automatically resets the ".jar" file association back to Java. If that does not work, look to see if your zip utility has an option in its preferences to release the ".jar" file association. Snap Backup freezes on me. Why? Snap Backup may have trouble completing the backup process if it encounters a problematic file, such as a file that is locked by another application or a file that is too huge to process. In such a situation, it is important to pinpoint which file is causing the problem. The last file listed in the Message Log section is likely the problematic file. Enable Snap Backup's filtering feature. → In the File menu, choose the Backup Filters option and then select On. Create a filter to skip over the folder containing the file you believe is most likely to be the problematic file. → Click the Edit Filter button, and in the "Skip folders matching:" field, enter the folder name. Then click the Ok button. Save the filter. → Click the Save Settings button. Test. → Click the Do Backup Now button to kick off the backup. If the backup hangs again, repeat the steps for a different folder. Note that the Cancel button is only able to abort in between processing files (it does not abort in the middle of processing a file). Sometimes this results in the Cancel button not being very responsive. How do I get past the "unidentified developer" security warning? <control-click> the .pkg installer file. 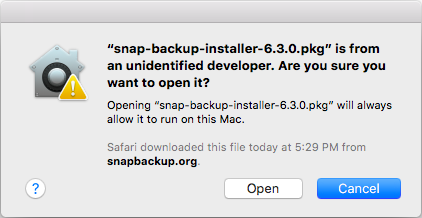 When attempting to install an open source Mac application, such as Snap Backup, you might encounter a message stating that the install file "can't be opened because it is from an unidentified developer". Macs provide a simple way to allow you to run such files – just <control-click> on the file and select "Open". How do I upgrade to a new version of Snap Backup? To upgrade your version of Snap Backup, simply install the new version. The new version will cleanly replace the old version, and all your backup settings will automatically be preserved.